That’s all the time Kelly Knodel needed, once the preparation work was finished, to pluck a 500 gallon fuel tank from beneath the ground near the foundation of the old electric power plant in Vermillion. 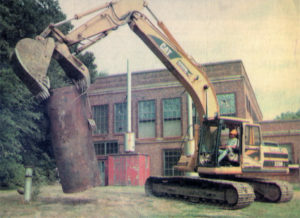 Knodel removed the tank with ease using a giant Caterpillar backhoe. Knodel may live on a farm near Freeman, but he’s discovered the best use of his time and equipment is the harvest of underground fuel tanks in counties throughout eastern South Dakota. One can’t help but notice that Knodel truly loves his work as a contractor specializing in demolition, the removal of building materials, and the creation of private lakes and dams. He couldn’t fire up his backhoe Tuesday afternoon until one of his employees finished pumping the light plant tank dry of its old fuel. Fuel oil doesn’t pose as high an explosive level as gasoline. Old tanks containing gasoline or other more highly charged fuels pose a greater risk. “I don’t want to blow my excavator to the next block,” Knodel said with a laugh. That’s why the back of his pickup is packed with dry ice—frozen carbon dioxide. Nearly everything that Knodel encounters in the process of removing undergound tanks is recycled. Old fuel he pumps from abandoned underground tanks is delivered to a waste oil recycler. Soil that must be removed is loaded onto one of Knodel’s trucks. “The soil is dumped at a licensed landfill, where it will be aerated in the sun,” he said. Ironically, Knodel had earlier removed buried tanks located at the Clay County landfill before beginning his work in the city. “We started on Monday, and we’ll be here most of the week,” Knodel said. One of the first tanks he removed in the city Monday was buried near Austin Elementary School. Tuesday morning, he dug up and removed a tank that was buried at the U.S. Army Reserve Center, located south of Gateway. The site, he believes, may have been the home of an implement dealership in Vermillion’s past. He then focused on plucking the tank from the old power plant. “There’s also a tank in the old rail bed located across the street from here,” he said Tuesday afternoon. Knodel Farms is following a near hectic pace as it works to clear counties of buried tanks. Sometimes he’s digging up a tank as small as 500 gallons. At those times, he admits, it may appear he’s going overboard, using such a large piece of equipment to remove a tiny tank. But often, especially when he’s working at the site of abandoned filling stations, he encounters 10,000-gallon tanks. Those are the times he’s glad he invested in a Caterpillar with more than enough muscle to get the job done. His work often is full of surprises. Knodel was told that he would only have to remove one tank when he visited a site in Springfield recently. Before he leaves Clay County, Knodel will have sunk his large backhoe at 34 different sites. “I’ll probably find from 40 to 50 tanks, he said.